Maryland Section 3 begins where the 4-mile Section 2 ends, crossing Wolfsville Road at a point roughly two miles south of Smithsburg, Maryland. 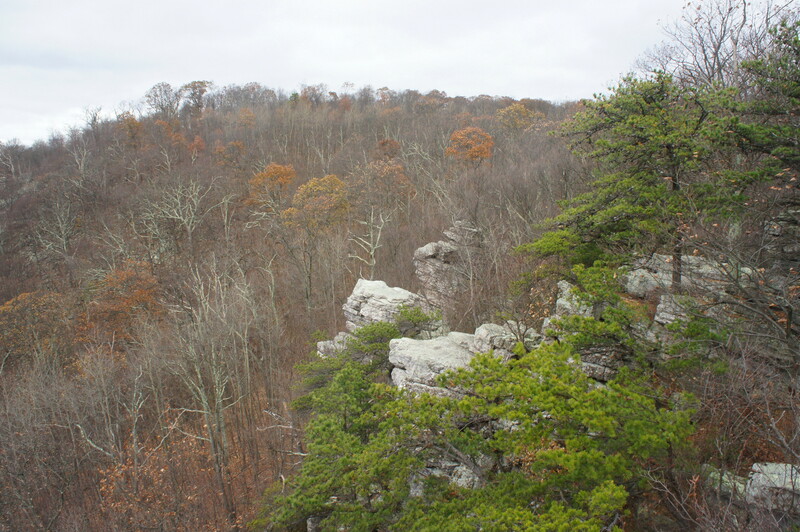 Surrounded by thick woods, look for a small, graveled parking lot on the east side of the road; this is the local access point for the Appalachian Trail (AT). From the parking area, head north on the blue-blazed path, which parallels the road and merges with the white-blazed AT after 1/10 mile. Bear left on the AT, traversing Wolfsville Road. Once across, the trail passes through a grove of hemlocks and begins a sharp ascent that covers 500 feet in elevation in ½ mile. Occasional switchbacks ease the climb, with some limited views through the trees as South Mountain extends north. 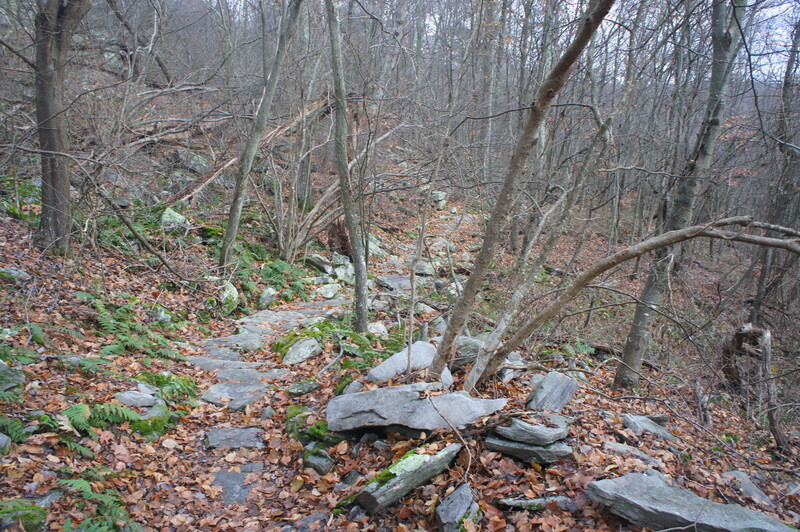 The trail climbs to an initial flat at 6/10 mile, and then pushes up and over a rocky ridge before dropping briefly and settling into leisurely level terrain at about 7/10 mile. The AT bears southwest, following the right flank of the lengthy mountain. For the next three miles, the path stays relatively stable at around 1,800 feet. In the winter season, it is possible to peek through the trees to the west, overlooking the vast Cumberland Valley, which extends more than 70 miles from Pennsylvania to the Potomac River. Crags of blocky quartzite, the predominant rock layer on South Mountain, line the ridge on the left. It is not until around 2.25 miles that the trail breaks with its level and steady direction, suddenly breaking southeast and climbing up and over the quartzite spine of South Mountain. 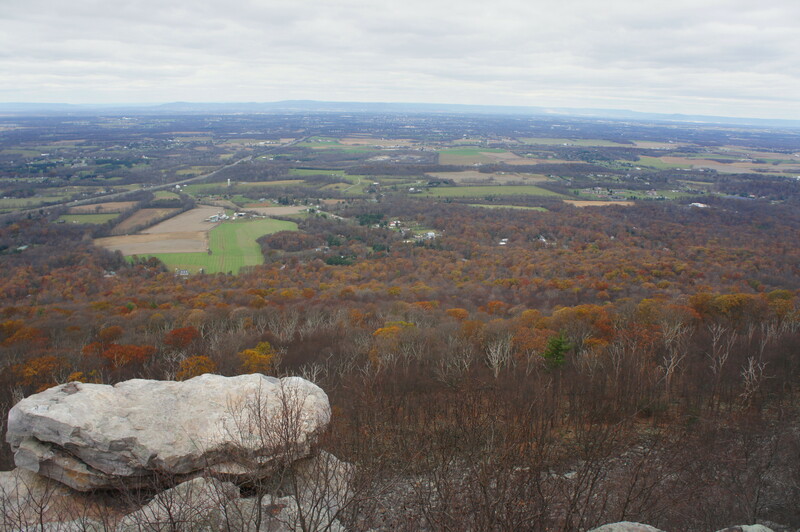 Here the trail becomes considerably rockier, and the views shift from westward over the Cumberland Valley to east over Middletown Valley. 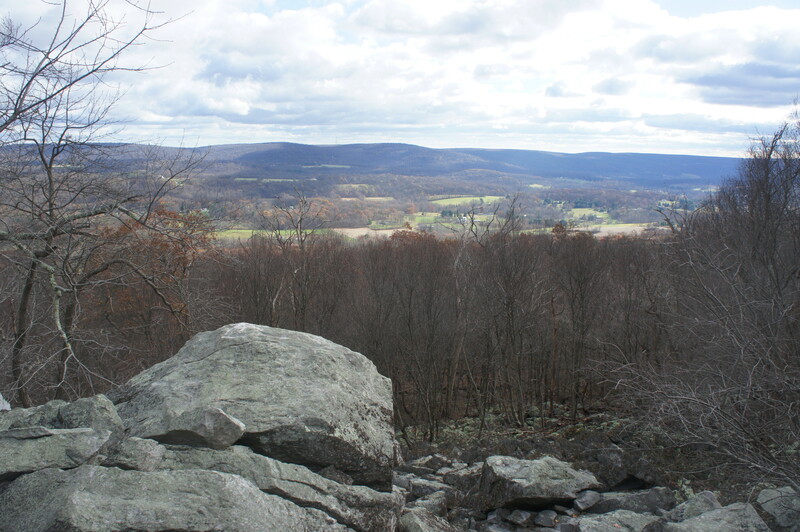 A rock slide at around 2.5 miles offers a rare unobstructed view through a window in the trees, overlooking Middletown Valley and the Catoctin Mountain range. This is a good spot to stop for a snack. Beyond the overlook, the rock-studded trail crests the section’s high point (1,895’) then weaves up and down a pair of smaller summits. 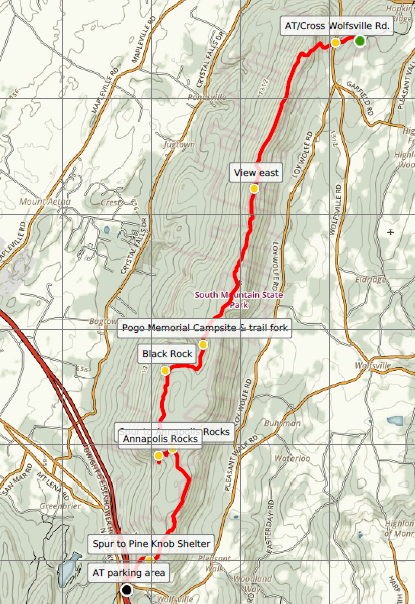 At around mile 4, the AT drops into Black Rock Gap; stay right at the junction with an old forest road at 4.2 miles. From here the trail sheds more than 150 feet in elevation as it approaches a woody hollow along the western slopes of South Mountain. At around 4.75 miles, the steep Thurston Griggs Trail bears off to the right, while Pogo Memorial Campsite appears up the slope on the left. (Note: The camp is named for Walter “Pogo” Rheinheimer, Jr., a member of the Maryland Mountain Club who drowned in a canoe accident near Harper’s Ferry in 1974.) Stay straight at the junction. 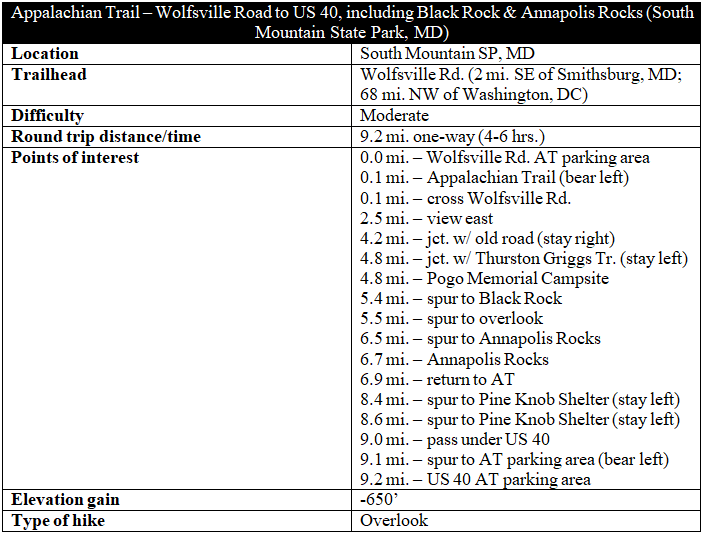 Bearing southwest, the AT begins to climb and crosses intermittent Black Rock Creek at about 4.9 miles. The incline eases as the trail turns west, approaching the ridgetop again at around 5.3 miles. Just steps farther, a marked spur leads east to Black Rock Cliff, undoubtedly one of the finest vistas in the area. 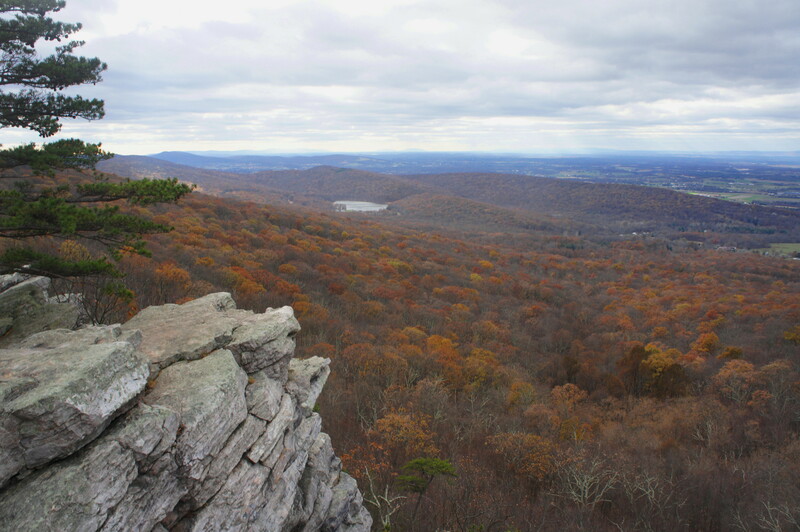 From Black Rock, Cumberland Valley appears stitched together by a patchwork of forest and farms, with the distant North Mountain and Bear Creek Mountains forming its western flank. Interstate 70 stretches out across the valley toward Hagerstown, Maryland, the largest town in the area. (Note: Cumberland Valley is alternatively known as Hagerstown Valley.) To the southwest, one can see as far as the West Virginia panhandle and northern Virginia beyond. Beyond the Black Rock viewpoint, the trail passes a second, unmarked viewpoint within minutes. The view from this outcrop is just as good as the first Black Rock vista. Past these two overlooks, the AT settles into another gentle stroll amid oaks, hickories, and occasional pines. After passing through a sea of mountain laurel, hikers will approach a trail junction at 6.5 miles. Bear right onto the 0.2-mile spur trail to Annapolis Rocks, one of the most popular mountain destinations in Maryland. From the start, the blue-blazed path drops and passes a picnic table, information kiosk, and pit toilet on the right. Thirteen campsites, including two group sites, are available in the area, with a spring about a ¼-mile walk away. 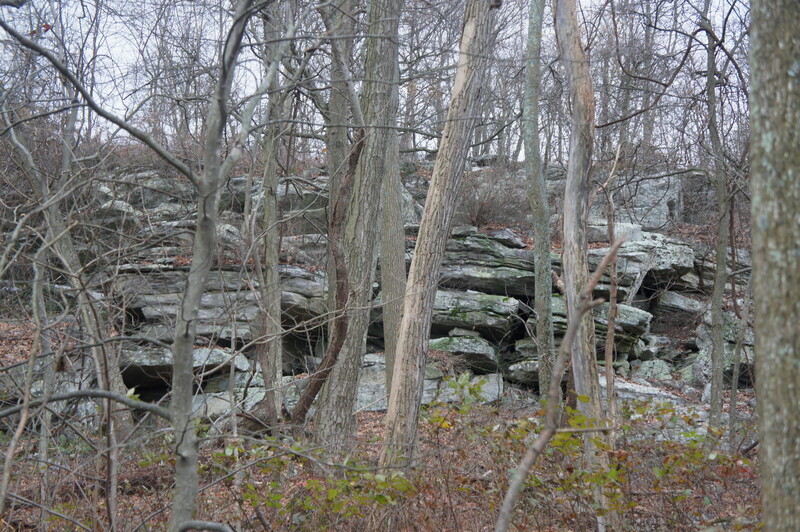 From the information sign, it is another 1/10 mile to Annapolis Rocks, chunks of quartzite perched on the edge of the west-facing cliff. While not as expansive as the views at Black Rock, the vistas here are arguably just as good: wooden hillsides spilling into the colorful valley, with Greenbrier Lake visible down to the southwest. 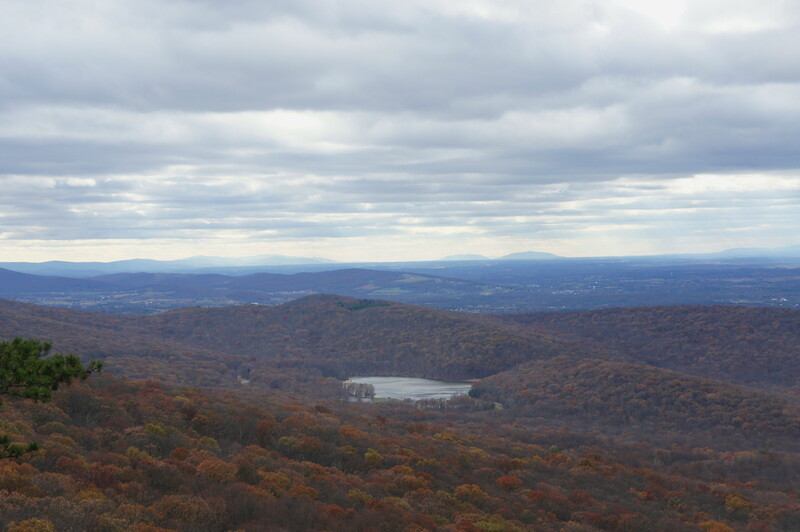 On clear days, Virginia’s Blue Ridge Mountains, Massanutten Mountain, and Great North Mountain are visible on the horizon. Once you have had your fill, turn around and retrace your steps for 2/10 mile, this time uphill, back to the AT. Bear right to begin the final leg of Section 3. 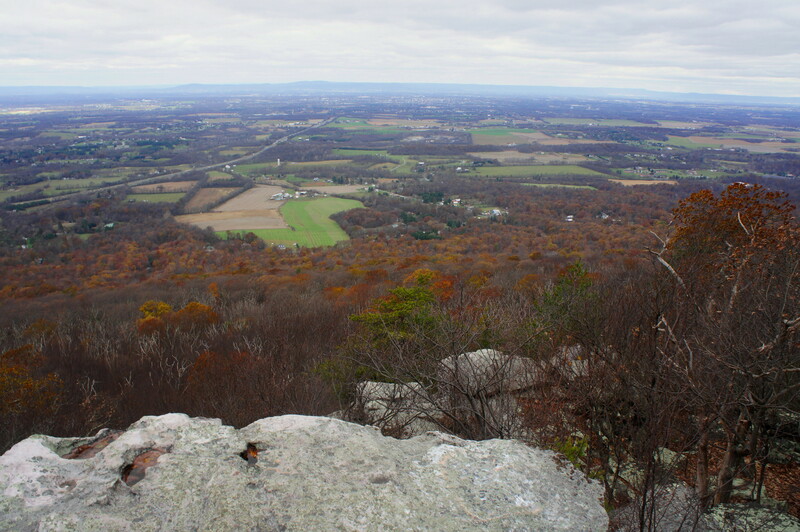 After dropping to a low saddle, the AT skirts the east flank of a ridgetop knob, where occasional outcrops offer obscured views of Middletown Valley. At about 7.6 miles, the trail begins a brief descent, followed by a steep uphill at 7.9 miles. Rising to a low saddle north of Pine Knob (1,714’), the AT then begins a sharp descent and reaches a junction at 8.4 miles, where a spur trail bears right to Pine Knob Shelter. Stay left. A second junction is reached 2/10 miles later; bear left again. Head southwest on the last stretch, passing under telephone lines and dropping to a low pass where US Highway 40 cuts through the South Mountain. The trail approaches Interstate 70 at 8.9 miles; bear left as the trail follows the interstate and crosses under US 40. Take a left at the next junction, leaving the AT behind, and climb up to a paved but unused road. One hundred yards down the road, you will reach the AT parking area along US Highway 40, sure to packed on a nice summer afternoon. Hopefully you will have left a second car here to shuttle back to the start; if not, turn around and retrace your steps—for 9.2 miles—back to Wolfsville Road. Allot between 4-6 hours for the one-way journey. 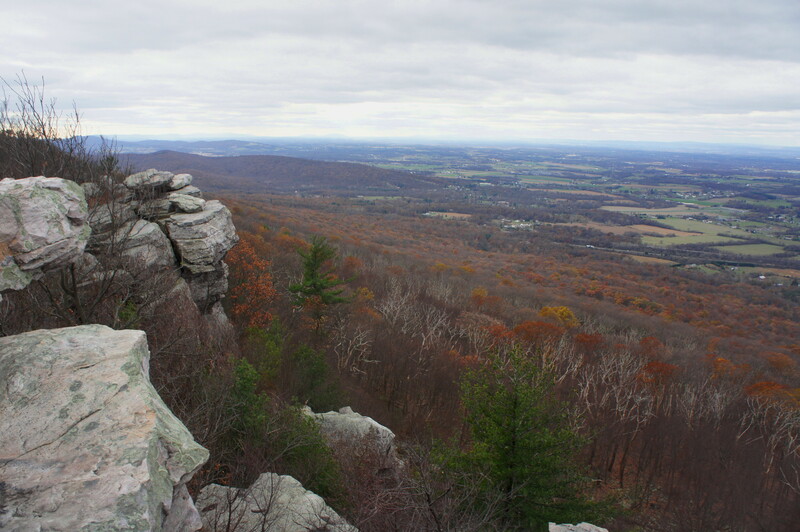 This entry was posted in Maryland, Moderate Hikes, South Mountain State Park and tagged Annapolis Rocks, Appalachian Trail, Black Rock, Cumberland Valley, Hagerstown Valley, Maryland, Pine Knob, Pogo Memorial Campsite, quartzite, South Mountain, South Mountain State Park. Bookmark the permalink.